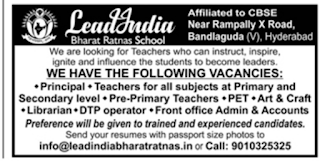 Bandlaguda,Hyderabad has advertised for the recruitment of Teaching Faculty- Principal,KG,PGT,PRT,TGT jobs vacancies. Interested and eligible job aspirants are requested to apply immediately.Check out further more details below. 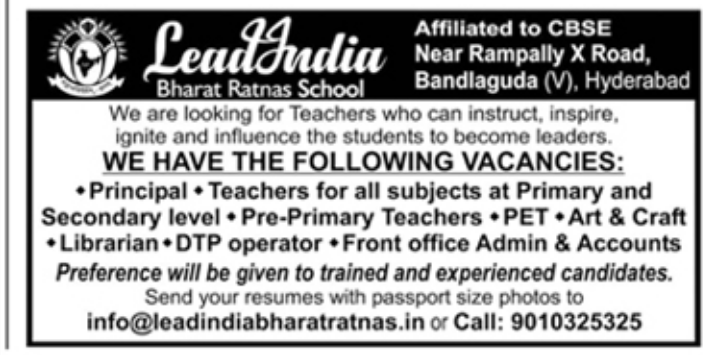 Name of the School: LeadIndia Bharat Ratnas school,Bandlaguda,Hyderabad. About School:A CBSE school established for Laying Foundation for Global Professional Leaders. We focus on Holistic Development of children with blended mix of intellectual and moral training that systematically enlarges the spheres of cognizance, develops character as well as mental volition. Evolve a definite pattern on relationship between an individual and the society. We promote the pursuit of excellence and create an ethos that encourages high academic standards, develop a thirst for knowledge and a passion for self reliance. Children are encouraged to look beyond the walls of classroom and develop the global perspective on life which has become the traits of LIBR School. Apart from this, we put focus on inculcating values, discipline, teamwork, leadership and communication skills.